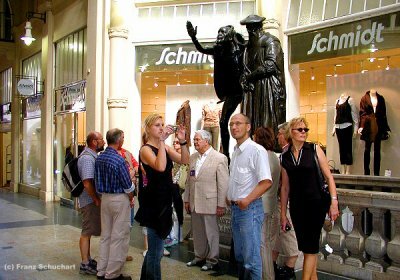 Leads you to the Central Station; Augustusplatz with the Opera House, Gewandhaus (concert hall), university, Mende-fountain and Krochhouse; Nikolai Churchyard with the Nikolai (St. Nicholas’s) Church, the old Nikolai School, Preacher’s House, and Nikolai column; the passage “Speck’s Hof�? ; Riquet-house; “Naschmarkt�? with the Old Stock Exchange and Goethe monument; the market square with the Old City Hall, Old Weigh House, Königshaus (king’s house) and other places; past the Katharinenstraße and Hainstraße to Barthel’s Hof; Kaffeebaum (coffee house); Thomas Churchyard with St. Thomas’s church, Bach monument and Bach museum; and the Mädler Passage with Auerbach’s Keller. Shows you, in particular, the secluded places, the inner and through courtyards, the street and open-air restaurants, as well as the glittering passages and shopping streets. The numerous sights are also not neglected. Follows in the footsteps of Johann Sebastian Bach, who lived and worked for 27 years in Leipzig as cantor of St. Thomas’s choir and musical director. About 500 compositions were written in Leipzig, including the “Magnificat�?, the “Mass in B Minor�?, “The Art of Fugue�?, “The Well-Tempered Clavier�?, as well as about 300 cantatas and motets. Acquaints you with the approximately 800 year musical history of the town, beginning with the foundation of the world-famous Thomanerchor (St. Thomas Choir) in 1212. The Leipzig Town Musicians were founded in 1479 and the excellent and world-famous Gewandhaus Orchestra in 1743. Around 1220 the minnesinger Heinrich von Mohrungen spent his twilight years in the Thomas Cloister. Other important musicians followed: J. S. Bach, Felix Mendelssohn Bartholdy, Richard Wagner, Robert and Clara Schumann (nee Wieck), Albert Lortzing, Gustav Mahler, E.T.A. Hoffmann, Arthur Nikisch, Wilhelm Furtwängler, Kurt Masur. The Leipzig institutions for the cultivation of music and musical education, the corresponding museums and archives, the musical festivals and competitions, as well as the musical publishers are also introduced to you. Introduces the important writers and publishers, as well as libraries in Leipzig to you. 1481 the first letterpress printing, 1650 the first daily newspaper, 1682 the first scholarly magazine. In 1688 Christian Thomasius held the first lecture in German and in 1737 the “ Neuberin�? (a theatre manager) bans “Hans-Wurst�? (the fool) from the stage. Such sonorous names as Johann Christoph Gottsched, Christian Fürchtegott Gellert, Friedrich Gottlieb Klopstock, Gotthold Ephraim Lessing, Johann Wolfgang von Goethe, Friedrich von Schiller, E.T.A. Hoffmann, Friedrich Nietzsche and Erich Loest are connected with Leipzig. 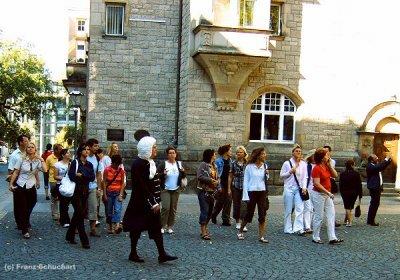 Follows in the footsteps of Johann Wolfgang von Goethe. He came here in 1765, at the age of 16, to study law. Katharina Schönkopf, called Käthchen, was the addressee of his first poems, found together in the “Songbook Annette�?. On the 28. August 1829, the Prince of Poets visited Leipzig for the last time on the occasion of the first performance of his “Faust�? and was enthusiastically celebrated. In “Poetry and Truth�? he later remembered his student days in Leipzig. He may have received the inspiration for “Faust�? in Auerbach’s Keller. Follows a similar route to the tour “Sights of the Inner City�?, with emphasis on amusing facts and anecdotes. Leads you into the “graphic district�? (the district of printing and publishing). The first book in Leipzig, „Glossa super Apokalypsim“ was printed as early as 1481, and by the second world war Leipzig was the leading printing and publishing town in Germany. But then, in a single night of bombing, around 1,000 commercial bookfirms were destroyed and 50 million books burnt. The route leads past important publishing and printing houses to the former centres of the German book trade. A visit to the graves of Leipzig publishers in the Old Johannes Graveyard can be combined with the tour. Is not only a place of peace and reflection, but also a living history book. Founded in 1278 (last burial 1883), it is now an oasis of peace near the city centre. Here you can see, e.g., the graves of Brockhaus, Reclam, Tauchnitz, Teubner, Rosina Wagner and Rosalia Marbach (mother and sister of Richard Wagner), as well as Anna Katharina Kanne (nee Schönkopf), Goethe’s Leipzig girlfriend. Architectural gems are the baroque tomb of the Baumgärtner family and the Egyptian column of the grave of the Egyptologist F.A.W. Spohn. Follows in the footsteps of the great reformer. He is said to have been in Leipzig 18 times, the last time in 1545, when he consecrated the university church for protestant services. “Leipzig is a fine town�? he said, “not only its buildings, but it is well protected, rich and stable, so that it stands like a doll�?. A mocking relief in the courtyard of the Fregehouse is said to describe Martin Luther’s defeat in the fight against the Kaiser and Pope. Shows you the largest terminus station in Europe, also one of the most beautiful. “Light and Air�? was the motto of its creators. You learn about its history and its fate, as well as about the brilliant technical achievement of the reconstruction in the middle of the 90s which gave it its present appearance. Awakens memories of the most important son of the town. Born in 1813 in Leipzig, he spent his decisive and formative years (after his childhood in Dresden) from 1827 to 1834 here. Here were also written his first orchestral works: the “Surprise Symphony�? in B flat major (1830) and the Concert Overture in D minor (1832). In 1868 he met the Leipzig student Friedrich Nietzsche, which was the beginning of a ten-year friendship. The certainly most important Leipzig Gewandhaus - Conductor was Felix Mendelssohn Bartholdy. Born in 1809, he came to Leipzig in 1835 (aged 26), where he worked until his death in 1847. Here, too, he founded the first conservatory in Germany in 1843. The only Mendelssohn - Museum worldwide (at the same time also the family´s only still existing abode) was established in Goldschmidtstraße 12, the house, where he lived and died. The walking tour follows Mendelssohn´s traces, e.g. : Mendelssohn - Memorial, St Thomas´s church, Städtisches Kaufhaus (site of the first Gewandhaus concert hall and the first conservatory), university church, Mendelssohn - House. On request also with a visit to the museum.